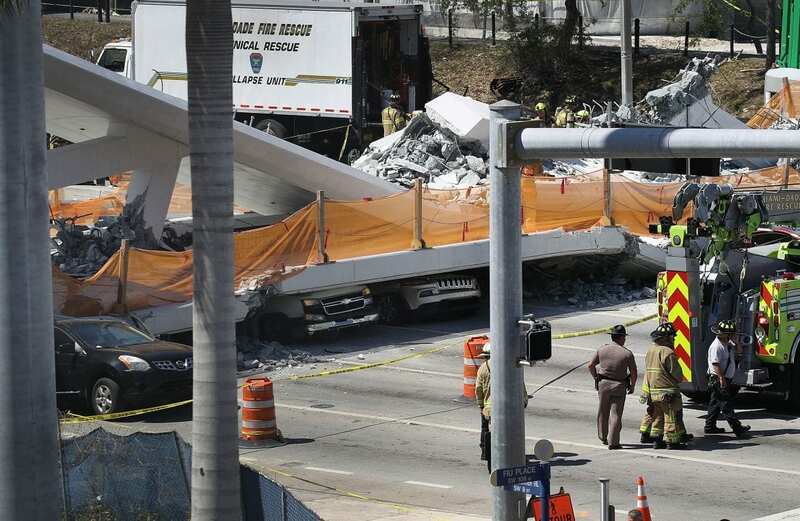 A Florida International University pedestrian bridge, still under construction, collapsed Thursday afternoon on a major roadway in the Miami area, trapping victims underneath. Miami-Dade Police said six people were found dead at the site and ten others were transported to area hospitals. “We have multiple victims; the number hasn’t been determined yet,” Miami Dade County Deputy Mayor Maurice Kemp said at a late afternoon news conference. Initially, authorities said four bodies had been recovered, but later, Miami Dade Police spokesman Alvaro Zabaleta said two more had been removed from the debris. “They’re still working away at that concrete,” Zabaleta said at a news conference early Friday. “Engineers told us last night that it has to be done very carefully. Not only because we have to preserve evidence, not only because there might be possible victims under there and we have to treat it very delicately. But because of the safety of the rescuers,” he said. Video footage showed the bridge collapsed onto a multilane highway, crushing vehicles underneath, and several people being loaded into ambulances. More than 100 search-and-rescue workers were using heavy equipment, search dogs and cranes, officials said. Officials asked the public to avoid the area “indefinitely” and directed people worried about loved ones to get in touch with the family reunification center on FIU’s campus. In a news conference late Thursday evening, FIU President Mark Rosenberg recalled that his university’s community had just celebrated over the weekend a milestone in the erection of the bridge, a project which was originally begun in 2010. Figg Bridge Engineers designed the bridge and said in a statement it was “stunned by today’s tragic collapse” and would fully cooperate in an investigation. “In our 40-year history, nothing like this has ever happened before,” the statement said. MCM Construction was building the Florida bridge and posted a statement expressing distress over the collapse and referring to a loss of life. Witnesses tell The Miami Herald the structure fell without warning around 1:30 p.m. as a traffic light went red and concrete fell on stopped vehicles. Other motorists rushed out of their cars to help. The main span of the bridge was installed on Saturday. The bridge was not expected to open to foot traffic until early next year, reports The Associated Press. It was intended to boost student safety, spanning a portion of U.S. Highway 41 known as the Tamiami Trail, to help people cross from campus to the city of Sweetwater, where the university said thousands of students live. The university is currently on spring break. The National Transportation Safety Board said it would send a “go team” to investigate the incident. A now-deleted tweet posted by FIU on Tuesday displayed a photo of the bridge. White House press secretary Sarah Huckabee Sanders said President Trump is aware of the bridge collapse and will continue to monitor the situation.